Pure's new Siesta S6 radio looks muy bien | What Hi-Fi? The Siesta S6 DAB+ and FM has 40 station presets as well as Bluetooth 4.0 support so you can stream from your smartphone. SnoozeTouch and Siesta mode mean you can nap and wake up easier, too. 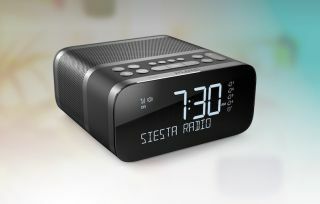 The Siesta S6 DAB+ and FM alarm clock radio is the latest in the company's line-up, and follows the sale of the company to Austrian firm AVenture AT last year. The Siesta S6 has 40 station presets and Bluetooth 4.0 compatability, so you can wake up to your favourite station or stream music from a smartphone or tablet. Your tunes are blasted out from a 6cm full range driver powered by a digital amplifier. There’s also a built-in USB port for charging mobile devices and a 3.5mm output for some headphones. On the clock side, the Siesta S6 has backlit controls and a 'SnoozeTouch' band that just needs tapping to silence any alarm. There are four separate alarm functions, a sleep timer, and a 'Siesta mode' where you can quickly set a five-minute alarm by tapping the button (or tap it repeatedly for a longer nap if you really don't want to get out of bed). The Siesta S6 is priced at £130, and is available now in polar (white-ish) and graphite (black-ish) finishes. But it can't read your emotions.